Upon arrival, your guide will greet you at the airport and accompany you to the hotel. 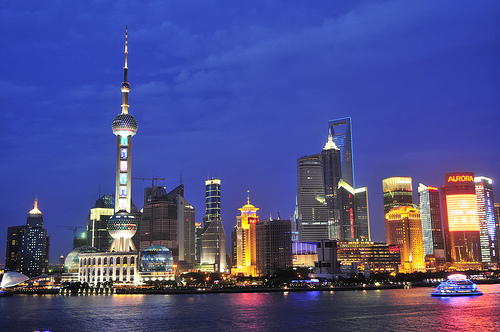 Enjoy the rest of the day or explore the splendid nightlife of Shanghai on your own. Shanghai is a comprehensive industrial base and the leading port in China. It is an amazing mix of western and eastern cultures, boasting both traditional Chinese features and its modern lifestyle. After breakfast, you will visit the Yuyuan Garden, an amazing Chinese traditional garden. Then you will be fascinated by the exquisite handcrafts and souvenirs at Yuyuan Market. Afterwards, take a stroll on the famous Nanjing Road and the Bund. Standing on the Oriental Pear TV Tower, you will get a panoramic view of the Bund and Pudong New District. The Yuyuan Garden, also known as the “Yu Garden”, is an eminent classical Chinese garden and famed as “an architectural miracle in South China”. Inside the Yu Garden, you will be fascinated with traditional Chinese style houses, grottoes, pavilions, lotus ponds, and zigzag bridges crossing streams. If you are a fashion-seeking shoppers, this is the right place for you where all-in-one shopping malls, gorgeous restaurants and spectacular night views can be found. Buildings with distinctive features erect on both side of the street, huge signboards and advertisements show the city’s prosperity. Located next to the Yuyuan Garden, it's a lively market that specializes in traditional Chinese arts and crafts. Souvenir hunters should not miss this hot tourist destination. Also you can try some Shanghai Xiao Long Bao, vegetarian buns, chicken soup to experience a little of the Shanghai culture. With 467.9 meters in height, It is the forth tower in height in Asia and the sixth tallest in the world, opposite to the Bund. Its transparent elevator will take you to the top, which will offer a quiet good view of Shanghai. The basement houses the Shanghai Municipal History Museum. 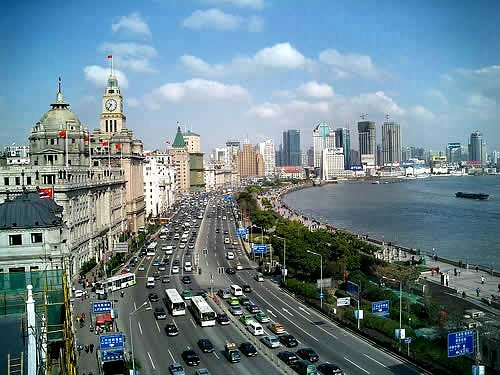 The Bund is always the first thing to hit tourists when they visit Shanghai as it is regarded as Shanghai’s magnificent landmark. It is a waterfront area of Pu Xi (Shanghai Old Town), facing the newer part of Shanghai – Pu Dong. You will be transferred to the airport for the flight to Xi'an after breakfast. Your local guide in Xi'an will great you and guide you to the hotel. In the afternoon, you will tour the Ancient City Wall.Strolling or Cycling on this largest and best-kept city wall in China is quite an experience. Then proceed to the Big Wild Goose Pagoda which offers an insight to Chinese people's religious life. 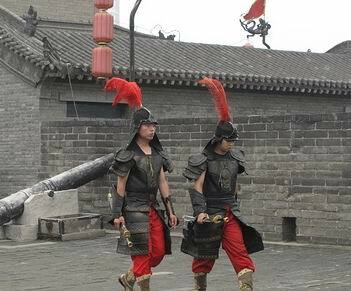 It is the most well-preserved ancient military defensive systems in the world. It is composed of the moat, hanging bridges, battlements, watchtowers, tunnels and parapet. Today, the roadway is a promenade enjoyed by strolling tourist. Cycling on the wall with families is a great thing! [ Optional ] Xian Dumplings Banquet: Chinese dumpling is one of the most important foods in Chinese New Year. Since the shape of Chinese dumplings is similar to ancient Chinese gold or silver ingots, they symbolize wealth. Traditionally, families get together to make dumplings for the Chinese New Year. 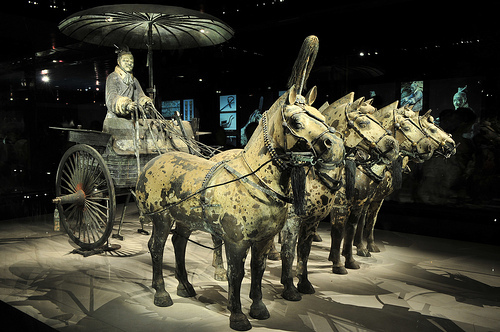 You will visit the incredible life-size Terracotta Warriors in the morning. Enjoy your delicious lunch in the restaurant near the scenic spot. In the afternoon, you will continue to tour the Great Mosque and the surrounding Muslim Quarter. Then take the night train to Beijing. The Muslim Quarter features a mix of Chinese and Islamic cultures. It wins the reputation for the alley lined with market stall and the tasty snack food. Meanwhile, it is a good place to head for when looking for those hard-to-find souvenirs. The Great Mosque is one of the largest and best-kept Islamic mosques in China, which was originally built in 742 AD during the Chinese Tang Dynasty(618-907). It combined Islamic culture with Chinese traditional architecture seamlessly and became most featured and renowned mosques in China. [ Optional ] Shadow Play: Shadow Play is a most popular folk drama in Northern China. It features interesting silhouettes which is made of hard paper and skin of buffalo and donkey. The performer manipulates the characters behind the screen while singing the libretto to tell the story. Your guide will pick you up at the train station and send you to the hotel. Enjoy the breakfast, you will stroll at the largest city plaza - Tiananmen Square,which always filled with kite-flyers. 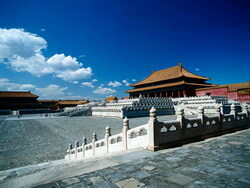 Follow up is the magnificent Forbidden City and the exquisite Summer Palace. [ Optional ] Peking Opera: With a history of 160 years, Peking Opera, extolled as “Oriental Opera”, is representative of all operas in China. Full of Chinese cultural traditions and tidbits, the opera presents the audience with touching stories, beautiful paintings, exquisite costumes, graceful gestures and martial arts.